BLUPOND Fit Over Glasses will transform your prescription eyewear. This is an Italian design Wrap Around Oversized Sunglasses. Enhance your street vision with the most advanced Anti-Glare technology for HD Clarity and Personal Safety. Protect your eyes from harsh environmental elements, such as unexpected reflections, bright headlights, and the sun’s harmful UV rays. Our TAC Polarized Lenses are a 7-layer composite system, complying with international UV400 sunglasses standards, designed to cut and diffuse harmful light, for an enhanced, more vivid outdoor experience. Timeless and classic Italian design, yet exuding ingenuity and innovation. Your Knight Visors are intuitively designed to fit as seamlessly over your prescription eyewear, as they are if worn alone. Complete with a functional flip-up feature, this fashion statement is both subtle yet sharp, for you to wear with confidence on or off the road. Available in our classic color way – Black Frames + Yellow Lenses. Don’t just buy new sunglasses. Invest in an all-new outdoor companion! Built to last amidst inevitable drops, scratches, and squishes. An old stand-by, our trustworthy sunglasses are made from the strongest polycarbonate materials, together with shatterproof lenses, reinforced hinges, and a protective coating. A strength and durability you can feel. Experience the comfort and reliability of our intelligently designed full-frame Night Visors. Complete with integrated nose pads and our rubberized support system for added security. Weighing in at just 35 grams, due to our super-light and ultra-thin polarized lenses, sporting these will be effortless, easy, and virtually unnoticeable. 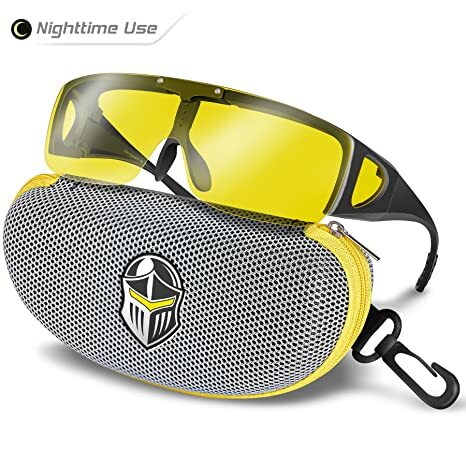 glasses, when purchasing these glasses you will get an EVA protective sports case, sunglasses pouch, micro fiber cleaning cloth, screwdriver, 10$ value car clip holder to hang your glasses safely in your car and BLUPOND’S extended warranty card. Now I never need to wear my contact lens to replace my glasses. Thanks to this!